In a medium bowl, beat the eggs, water, salt and pepper with a fork or wire whisk until well mixed. In a 10-inch skillet, heat the butter over medium heat just until it begins to sizzle and look hot. Pour egg mixture into skillet. The egg mixture will become firm at the bottom and side very quickly. When this happens, gently lift the cooked portions around the edge with a turner so that the thin, uncooked portion can flow to the bottom. 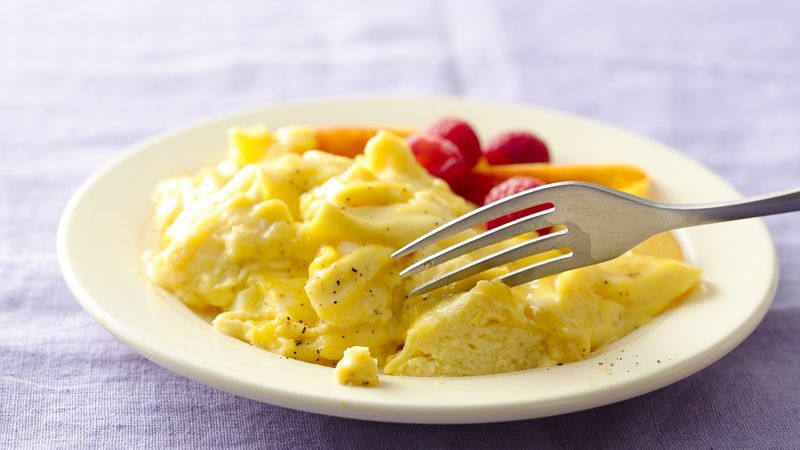 Avoid constant stirring because the eggs will become dry and rubbery rather than light and fluffy. Cook 3 to 4 minutes or until eggs are thickened throughout but still moist and creamy. Serve immediately. Before buying eggs, open the carton and check that the eggs are clean and uncracked. Gently move each egg to be sure it hasn't cracked and stuck to the carton. If an egg cracks on the way home, throw it away. Gently lift the cooked portions with a turner so the thin, uncooked portion can flow to the bottom and cook.